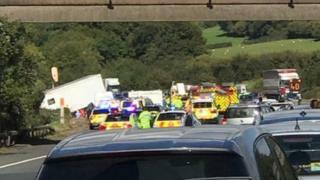 Image caption Five people died in the crash when two cars struck a converted horsebox on the M5. A van was seen launching into the air before it smashed through a motorway reservation, killing five people, an inquest has heard. The converted horsebox hit two cars, "obliterating" one in the crash on the M5 in September 2017. An inquest was told drivers heard an explosion from the vehicle shortly before the scenes of "total carnage". Audrey Hodge, 84; Richard Evans, 66; his wife Elaine Evans, 62; and Adrian Beaumont, 46, died at the scene. Mr Beaumont's partner, Rebecca Mitchell died in hospital the following April. The crash happened at junction 14 near Falfield, Gloucestershire, on September 16. Driver, James Clacton, said he was driving alongside the horsebox when he heard the "explosion" and saw the driver of the vehicle fighting with the steering wheel. He then saw it crash through the central reservation barrier and into oncoming traffic. "Kids were screaming, people were shouting, there was a lot going on," he said. Another witness, Sharon Wright, said the van "launched itself" from the central reservation before "obliterating" the car carrying Mr Beaumont and Ms Mitchell. Coroner Maria Voisin told the inquest that the van had passed its MOT in March 2017 but was given an advisory on the condition of its tyres. A vehicle examiner for the Driver and Vehicle Standards Agency, Gary Ford, told the inquest the front tyre had been "re-cut" close to its breaker cord, a metal strip in the tyre that reduces shocks. Mr Ford said the tread on tyres could be scooped out to increase their depth and prolong the life of tyres when they reached their legal limit.